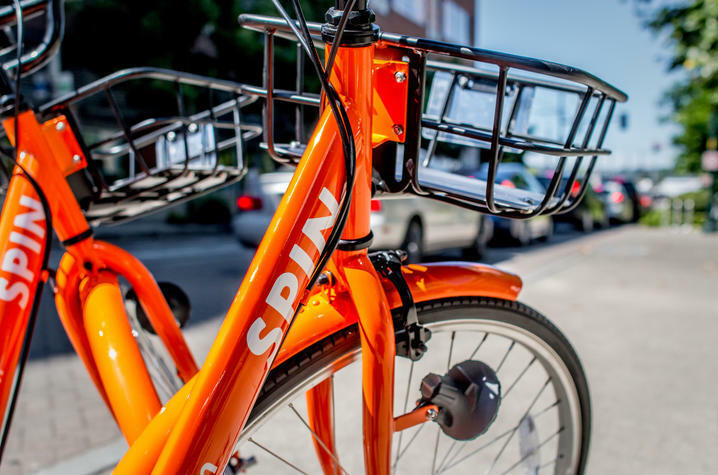 Over the summer, UK announced a partnership with Spin, a personal mobility company that supports a new bike-share program, both on campus and throughout the city of Lexington. You may have seen these bright orange bikes parked at our more than 5,000 bike parking spots across campus. UK community members can utilize this service by downloading the Spin app, creating a membership with their uky.edu email address, and then finding the bike nearest them using the app. Since launching in late June almost 10,000 Lexington residents have downloaded the app; including almost 2,000 members of the UK community. We look forward to seeing how students utilize the program, now that they are back on campus. UK Students and employees can ride for $0.50 per half hour, or purchase unlimited monthly rides for $14, or unlimited annual rides for $49. This represents a 50% discount on standard fares. UK students and employees may also qualify for a free annual membership through Transportation Services’ Commute Club Program. While our agreement is separate from the city’s partnership with Spin, UK community members can pick up or drop off the bikes both on- and off-campus. On campus, the bikes must be left at a bike rack. You can read more about how our city is embracing the program here. Per our agreement, Spin will rebalance bikes to high priority areas on campus daily, Monday through Friday. These zones are clearly identified on the UK Interactive Bicycle Map. When we think about developing new programs like this, we always keep as our central focus our commitment to improve mobility to, from, and around the campus for all members of the UK community, in alignment with our goals in the UK Transportation Master Plan (TMP). This program is a great example of that promise. Not only are we expanding the number of options offered to improve access and mobility, these options are also benefiting the campus, community, and environment. Moreover, to help students and employees more easily navigate the wide variety of transportation options available, Transportation Services is now also offering free personalized commute planning assistance. This initiative further showcases our commitment to the UK family—continuous improvement and innovative thinking to serve the campus’ mobility needs and to promote sustainability. Visit www.uky.edu/bikeshare for more information on the program. As always, we value your input. Please send your questions and comments to http://www.uky.edu/transportation/contact-us.